Butte County Sheriff Korey Honea said Friday that some people were found inside their cars, but that he doesn't have all the details on the circumstances of the deaths. 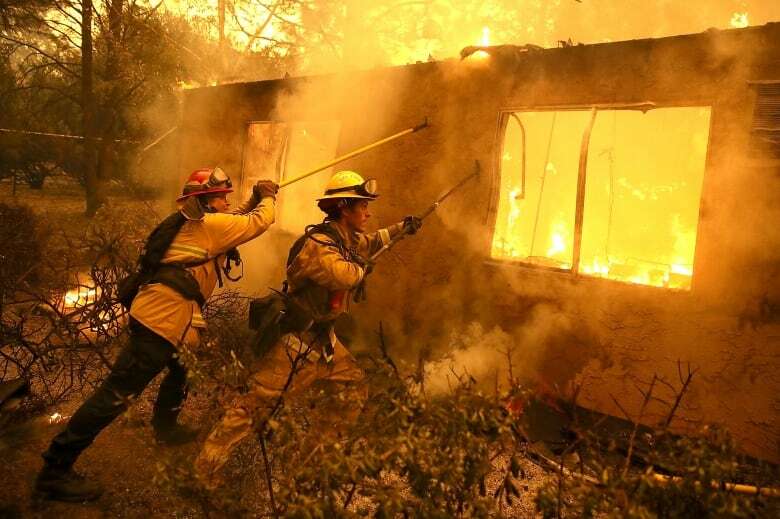 The fires weren't limited to the north end of the sprawling state — crews in Southern California were also dealing with two major blazes that sparked evacuations in areas like Malibu. "The magnitude of the destruction we're seeing is unbelievable," Mark Ghilarducci, of the California Governor's Office of Emergency Services, said earlier Friday. More than 6,000 firefighters were on firelines across the state on Friday morning, a top Cal Fire official said. Camp Fire, in northern Butte County. Hill Fire, in southern Ventura County. Woolsey Fire, in southern Ventura County. State officials said more than 150,000 people had been forced from their homes. Evacuation orders included the entire city of Malibu, which is home to 13,000, among them some of Hollywood's biggest stars. 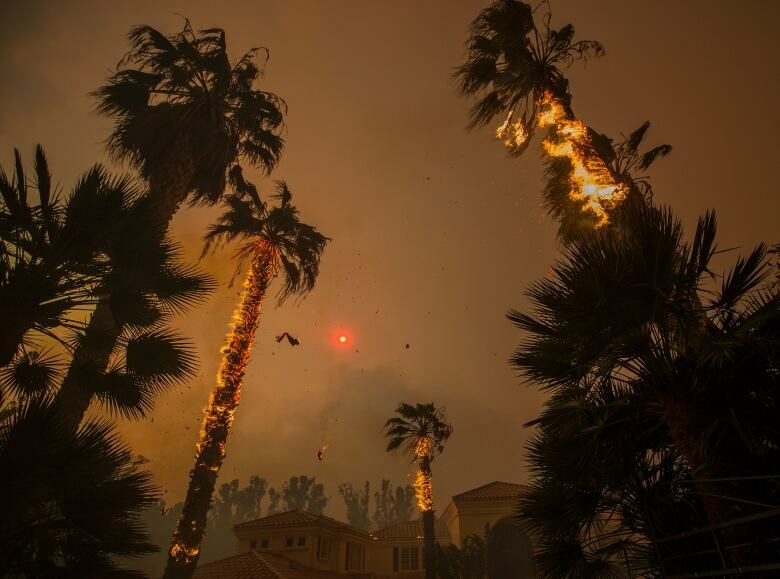 Early Friday evening, fire and law enforcement officials in Southern California reiterated how dangerous the situation is, and urged people to respect evacuation orders and be cautious. Ventura County Fire Chief Mark Lorenzen said crews were making progress on the Hill Fire, which had grown to around 24 square kilometres. "We're making good progress and we remain optimistic," he said of that fire. But Lorenzen expressed serious concern about the Woolsey Fire, saying it's grown significantly and that crews are struggling with conditions as they try to fight it. "My message to the public is, even though the wind has died down, stay on guard," he said. "We're in the seventh year of a drought, our weather conditions out there, and our fuel conditions, are absolutely ripe for fire." 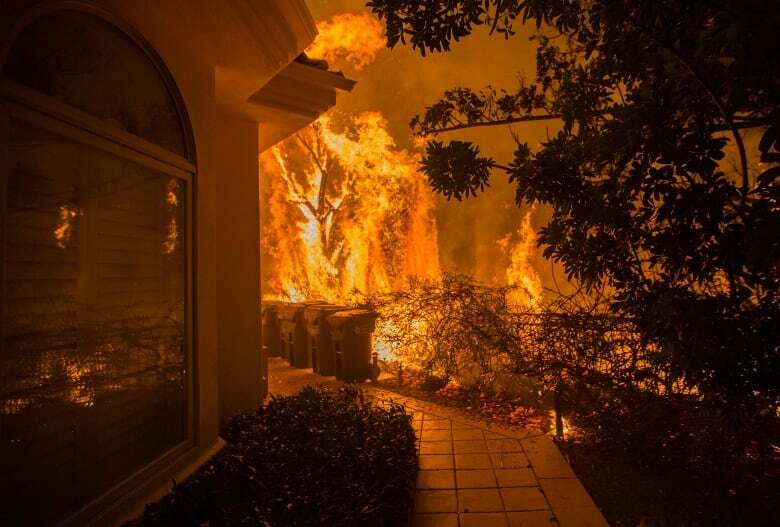 Meanwhile, the president declared an emergency in California and ordered federal assistance to help existing efforts to beat back the fires and support residents. Only a day after it began, the blaze near the northern town of Paradise had grown to nearly 285 square kilometres and was burning completely out of control. "There was really no firefight involved," Capt. 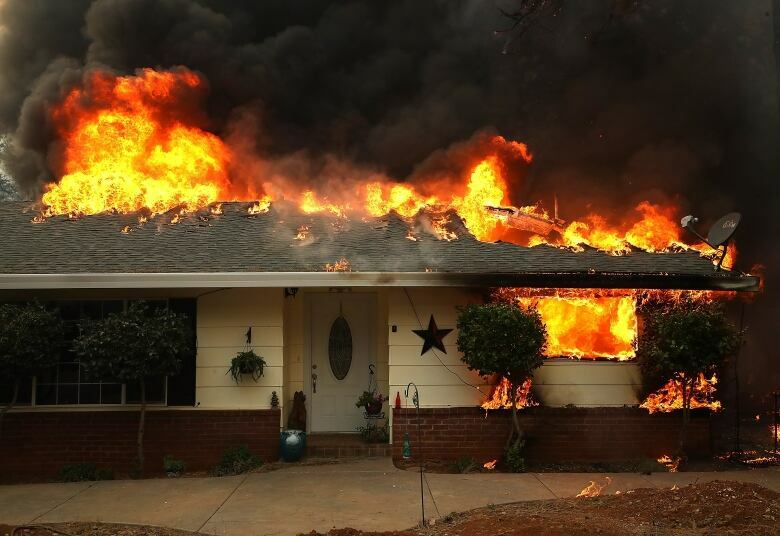 Scott McLean of the California Department of Forestry and Fire Protection (Cal Fire) said, explaining that crews gave up attacking the flames and instead helped people get out alive. "These firefighters were in the rescue mode all day yesterday." Facebook user Brynn Parrott Chatfield posted a video of the devastation. McLean estimated that the lost buildings numbered in the thousands in Paradise, about 290 kilometres northeast of San Francisco. At one burnt-out house, flames still smoldered inside what appeared to be a weight room. The rubble included a pair of dumbbells with the rubber melted off and the skeletons of a metal pull-up bar and other exercise equipment. The grass and elaborate landscaping all around the brick and stucco home remained an emerald green. Red pool umbrellas were furled near lounge chairs and showed not a singe on them. "I was frantic," she said. After an hour of no movement, she abandoned the truck and decided to try her luck on foot. While walking, a stranger in the traffic jam rolled down her window and asked Miller if she needed help. Miller at first scoffed at the notion of getting back in a vehicle. Then she reconsidered, thinking: "I'm really scared. This is terrifying. I can't breathe. I can't see, and maybe I should humble myself and get in this woman's car." 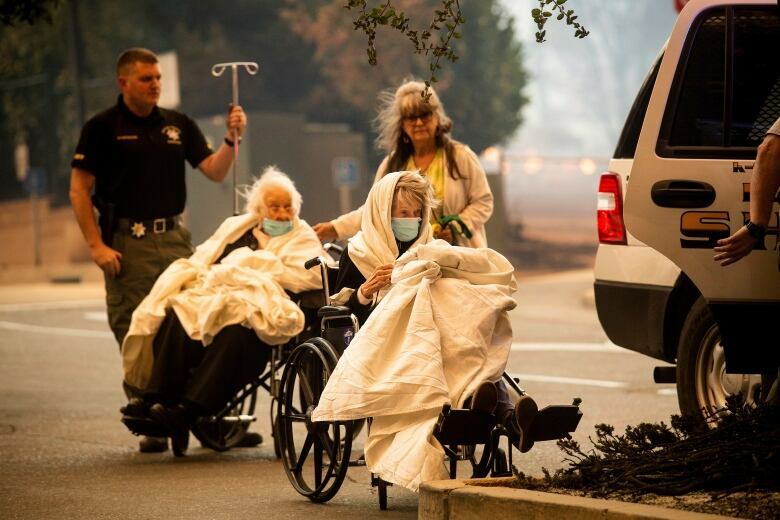 The stranger helped Miller pack up her mother and took them to safety in Chico. It took three hours to travel the 22 kilometres. Kelly Lee called shelters looking for her husband's 93-year-old grandmother, Dorothy Herrera, who was last heard from Thursday morning. Herrera, who lives in Paradise with her 88-year-old husband, Lou, left a frantic voicemail around 9:30 a.m. PT saying they needed to get out. "We never heard from them again," Lee said. "We're worried sick… They do have a car, but they both are older and can be confused at times." The missing included Richard Wayne Johnson and his wife, Suzanne, who lived in an RV park in Paradise that burned, according to his daughter Dawn Johnson of Independent, Ore.
Johnson said she has not been able to reach them by cellphone, and members of the couple's Jehovah's Witnesses Kingdom Hall in Paradise told her they have not seem them at local shelters.